+ roughly 17,000 square feet of office space. Among the tenants lined is Equinox. James Easton of MJ Engineering introduced an adjusted site plan that increased the amount of green space behind the building, something planning board members expressed interest in back in October. Expanding the green space pushes the site's U-shaped parking lot farther back on the site, and closer to surrounding neighbors (there would still be a buffer). When the project came up in October, there were no public comments. But this time Common Council member-elect Alfredo Balarin -- who's currently president of the Beverwyck Neighborhood Association -- was there with BNA vice president Alan Lescak. In his remarks, Balarin expressed that the neighborhood association is in favor of developing the site, but stressed a strong desire for neighbors to be involved in the development process. They ran out of time in their public comment before taking up many specific issues, but Balarin indicated the adjusted site plan is the opposite of what neighbors were seeking. And he said neighbors are concerned about people walking through the property from the back (which is Kent Street). With their comment time over, Balarin and Lescak submitted written comments based on earlier neighborhood meetings. Concerns expressed in those comments include how development of the site fits in with the rest of the neighborhood, the services Equinox would be offering, the types of tenants in the apartments, and the mix of street level retail. There are still a bunch of technical reviews needed for this project, and it will be making a return trip to the board in the future. FM Promontory Capital is proposing to redevelop a portion of the commercial strip across from St. Peter's Hospital at New Scotland Ave and South Allen Street, along with building new apartments on a piece of land behind the strip. This was the first time up for the project at a regular board meeting, but we've already mentioned it before -- it was the subject of a neighborhood meeting back in November. 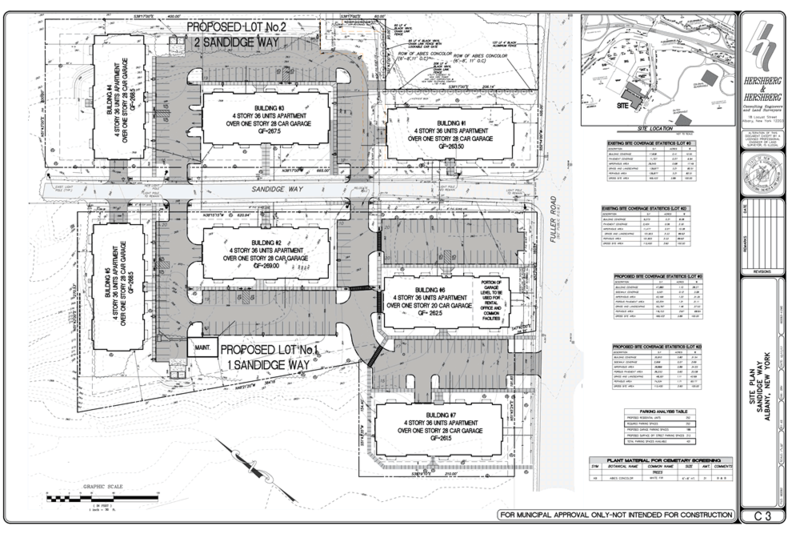 + Demolish a large portion of the existing retail strip along New Scotland Ave and building new retail spaces with parking underneath (73 spaces). The post office there would continue to be a tenant. + The location of the apartment building has been shifted west to create more of a buffer with the homes along West Lawrence. That also results in moving the building closer to the residential buildings on South Allen. + The exterior of the apartment building has a new look, swapping out the very faintly modern look of the original design for what's at the top. The originally-released version of the exterior. That neighborhood meeting in November included a lot of sour responses to this plan. And in his comments to the planning board, Hershberg was clearly pursuing the "hey, this could have been a lot worse" strategy, showing renderings for earlier projects floated for the site that never made it this far. They included a large medical office building as well as a pharmacy chain location. The planning board still appeared unimpressed. Chair Al DeSalvo called the plan a "pretty clumsy use of the site," noting he didn't think it worked particularly well for pedestrians or cars. 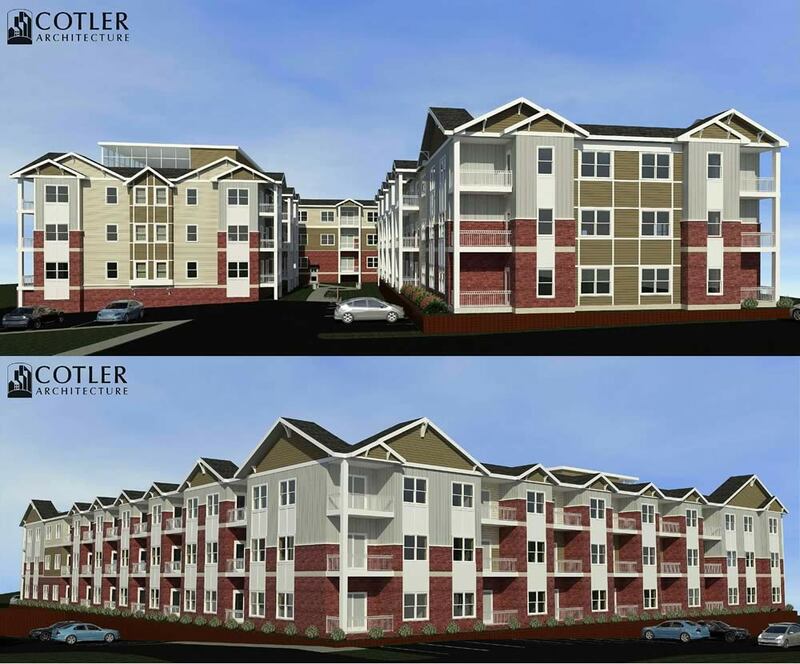 Both DeSalvo and board member Alison Bates questioned why the retail strip along New Scotland didn't include second or third-floor residential and thus reduce the footprint of the apartment building in the back of the site. Hershberg said it would be difficult to provide parking for residential units next to/below the commercial strip and said the developers believed people wouldn't be interested in the units without it. DeSalvo pointed out that site is in the middle of a walkable neighborhood and is served by multiple bus lines. + The scale of the apartment building is too big. + The proposed buildings are not attractive. Commenters suggested drawing inspiration for the design from brick, wood, brownstones, and Albany's Dutch heritage. + Traffic already backs up at this spot during rush hours, and commenters said they were worried the project will make the New Scotland Ave corridor even more congested. This project will be back up before the board at least a few more times, so it will be worth watching how it changes based on the feedback from the board and public. + 252 residential units spread across 7 four-story buildings. The units would a mix of 140 1BR units and 2 the rest 2BR. + The four stories would be over parking garages. + Total parking space for the project: 401 -- 188 of them in the garages. + The building facing Fuller Road would include a rental office and common areas for the complex. + The complex would also include a maintenance shed. + To make room for the new buildings, 13 single-family homes would be demolished. Eleven of those are currently vacant and already owned by the developer. The two others are at 273 and 275 Fuller Road and would be acquired if the project moves forward. Spencer Jones of DHM and Dan Hershberg were there to rep the project. 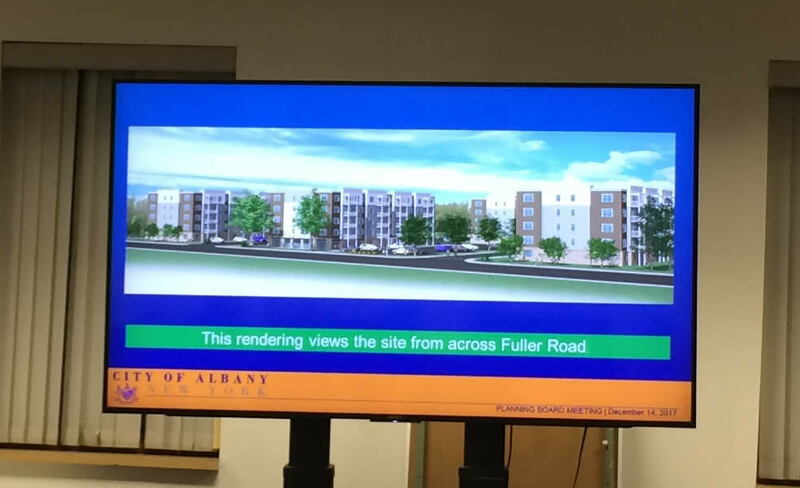 Though the project is located right next to SUNY Poly and across the street from UAlbany, Jones told the board the developers don't view the apartments as student housing. Rather, he said they thought it would be an attractive place to live for people working at the academic campuses or at Stuyvesant Plaza, which is 1/3 a mile to the south. Jones also touched on traffic, reporting that a traffic study indicated the new units wouldn't significantly degrade the flow of Fuller Road. Then it was on to public comments... and there were some comments about both the specifics of the project and the history of the site itself. As in the final stretch of the Rezone Albany process, which included the rezoning of Sandidge Way to allow this sort of development, multiple Guilderland residents from nearby streets off Fuller Road appeared to make critical comments about the size of the project (now even larger than version previously floated) and its impact on traffic, especially from cars turning onto and off of Fuller. They also expressed dismay about the effect the addition of 7 multi-story apartment buildings would have on the character of the neighborhood of smaller one-family homes. And then there's the history of the site. It had originally been floated for a SUNY Poly dorm project involving Columbia Development. It was that project -- more specifically the process surrounding it -- that prompted the state Attorney General's Office to file bid-rigging charges against former SUNY Poly nano emperor Alain Kaloyeros and Columbia Development's Joe Nicolla. (Both have pleaded not guilty to the charges -- an attorney for Nicolla has called the allegations against his client "absolute nonsense.") An affiliate of Columbia sold the land in 2016 to the backers of the current project. This history was the subject of multiple public comments at the planning board meeting. Don Reeb, who until earlier this year had been the longtime president of the McKownville Improvement Association, delivered a fiery speech in which he said the site and the project are tainted by corruption, raised the possibility of further corruption, and -- after being urged by chair Al DeSalvo to stick to the plan before the board -- argued apartments are inappropriate for the site. "People are going to get screwed and that's what you're participating in," Reeb told the board loudly. The large majority of the commenters for this project were Guilderland residents. So afterward we asked Al DeSalvo whether the board would weigh comments from non-city residents differently. He said they would get full consideration. "They raised some very good points," DeSalvo said of the commenters, pointing to concerns about the project's lack of green space or an area for kids to play. This project will be back before the board multiple times. One quirk about this project: The homes on Sandidge Way currently get their water service from UAlbany. The city water department monitors their usage and then credits UAlbany for the water. The arrangement stretches back to when the homes, on the edge of the city, didn't have city water and development of the UAlbany campus opened up the possibility. Here's the thing, though: According to DHM's Spencer Jones, the city has not been able to find any explicit contract or documentation about this arrangement, which prompts questions about the details of the arrangement. As it happens, because of concerns about low water pressure, the project may end up running a new water line up to Washington Ave to connect with a main there. Adam Clark, the owner of 45 Parkwood Street, pitched his plan to convert the basement of his one-family house into an apartment unit. There was one public comment against the plan. 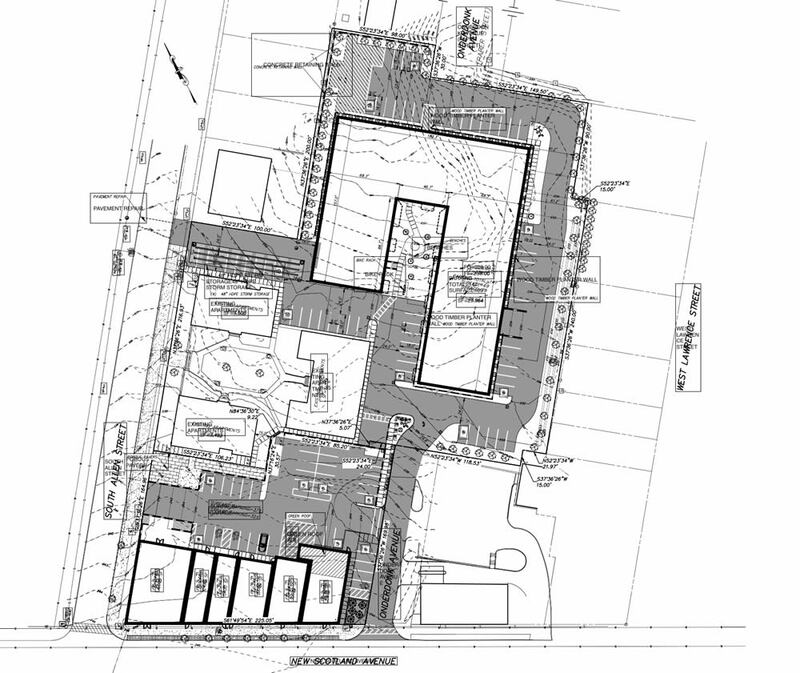 The board didn't make a decision -- the conditional use permit requires a public hearing. But there seem to be at least some skepticism about the idea. Both the Playdium redevelopment and the big Quackenbush Square mixed-used project had been on the agenda for this meeting, but they were bumped to the January 18 meeting. This was the last meeting for Alison Bates, whose term on the board is ending. Al DeSalvo opened the meeting by thanking her for her service. * This write-up got delayed by the demise of a laptop with all the notes. RIP, Macbook. I just can't figure out why the residents of the Capitol region wouldn't want more housing. Everybody complains about taxes, but absolutely refuses to allow more households in their neighborhoods, which would help alleviate those tax bills. More NIMBY BS. Thanks AOA for taking the time to keep up with these meetings and report on them. I'm sure I'm in the majority who barely have these things on the radar and unfortunately fall into the trap of thinking "I have more important things to do". most of the people who comment at these meetings represent the thinking that's guided planning decisions for the last 60 years: sprawling, prejudiced, car-first development that has hollowed out our downtowns. of course building up must be done with consideration for neighborhoods, but the fervent resistance to even a whiff of increased density is holding back the region as a whole, and it's well past time to let new voices into the conversation. If these projects are done properly, they should improve the overall condition of Albany. The city needs more people and more housing. At the same time, I understand the concerns of the neighbors. Property rights don't really matter in this country unless you're rich. Property rights for the poor certainly don't exist. For the middle class, we've designed a system in which the only wealth you can really accumulate comes in the form of home equity. I can understand that Americans, in the absence of a strong social safety net that people in other rich countries take for granted, get quite NIMBYist when something new is proposed for their neighborhood that might have seen or unforeseen consequences on them and their neighborhood. It's a symptom of a deeply flawed and inequitable economic system. Build all you want, but stop giving these developers massive tax breaks. My taxes go up, and they make millions while receiving tax breaks, and the rest of us have to pay for the services they receive through taxes. This scenario needs to end. Where's my tax break? My taxes only go up! Uninspired buildings in the wrong areas. Why? How about community housing, co-ops, condos you can buy instead of rent? Where are the architects with fresh ideas? Moved to NYC or Montreal? Let's be brave for once and create affordable beauty we can live in and become part of the neighborhood instead of being the outsider/transient/renter. Love seeing new housing options in the City but agree that many of us "empty nesters" would love the option of buying a condo in the city limits ( without it sitting on the Thruway thank you) . How about some condo units as an option in the Pladium site, New Scotland , etc... so that we can keep our investment in the City and still be in a walkable area near Pine Hills or uptown. Not all of us want to live downtown. As I read the comments from people expressing â€œNIMBY bsâ€ take a ride on Orlando Ave and see the new house the city has OKâ€™ed and has changed the neighborhood. Maybe the board members should do some on site inspections before making their decisions. Folks, you realize the ONLY people that come to planning and zoning boards meetings are there to complain, right? so any of the comments above about density, good city planning and urbanism are lost unless you actually show up, right?